Last weekend I finally got around to cleaning out my file cabinet and in the process, found all sorts of hidden treasures. There was the report of my ‘arrest’ for vagrancy in 1969 when the Town of Midland police department agreed to let my friends and I sleep in the jail overnight so we would not have to spend money on a hotel. The officer signed his title as “Occifer” to ensure that the document remained ‘unofficial’. Then there was my Air Canada “Flight to the Moon” certificate issued after the Moon landing in 1969, when the airline perhaps jumped the gun a bit with enthusiasm by agreeing to start a wait-list for Moon flights. I will keep waiting and wondering how many Aeroplan points that trip will add to my total. But what brought a sentimental tear to my eye was the discovery of the file of my very first credit card scam in 1993, and the thought of celebrating the 20th anniversary of this momentous event was emotionally overwhelming. While I was flying back to Toronto from a trip to Thailand, the travel agency in the lobby of my hotel in Bangkok, decided to fax my credit card information to Chiang Mai—361 miles to the north —where an associate proceeded to charge 46,750 Baht (roughly $2500.00 at the time) to my VISA card. I only used that card once during my entire trip. My alibi was that I was 40,000 feet above the Pacific on a Korean Airlines flight when my shopping spree supposedly took place. The evidence that I uncovered now, twenty years later, was a photocopy of the signed ‘charge’ that VISA sent to me as part of the fraud investigation. Ahhh, one more travel scam to add to my collection which now tips the scales at about 150 different scams. A travel scam is any form of trickery, deceit, misrepresentation, lying or taking advantage of someone that ends up separating that person from a possession (e.g. a camera, laptop, briefcase etc.) or their money. And while the travel industry may enjoy a high season from December through March, travel scams flourish, thrive and prosper throughout the year. The most common scams are labelled as ‘distraction scams’. Simple enough to execute, they usually involve two scam artists. One creates the distraction while the other runs off with your possessions. A typical distraction would be the classic scenario of someone enjoying a cappuccino in one of the squares in Rome. The tour guide instructs everyone to head back to the bus and just at that moment, a stranger pretends to trip in your direction and spills his coffee all over you. You are shocked, upset at the dark liquid on your clean clothes and definitely not paying attention to the digital camera you had on the table, along with your jacket (containing your wallet). You get up quickly. The stranger is extremely apologetic and offers to get napkins to clean up your outfit. In the meantime, scam artist #2 has already disappeared with your camera and jacket. And as soon as soon as you discover this, the stranger has disappeared into the crowd too. Other forms of this scam include tripping and dumping the contents of a hotdog (mustard, relish, ketchup) on the victim, as well as the ‘baby-bundle’ routine. In this scenario a woman has a bundle of rags that resemble a baby. She cradles the rags, rocks them and makes cooing sounds to convince everyone that there is a real baby in her arms. Then at the appropriate moment, say when a street car or a subway or a bus approaches, or even when a crowd is ogling at Niagara Falls, she drops the ‘baby’ over the falls or in front of the oncoming vehicle. Everyone is shocked beyond belief at what they just saw and while in their state of distractedness, scam artist #2 goes to work picking pockets, stealing wallets and even some laptops that may be abandoned for only a few seconds. But aside from distractions, travel scams can include simple but ingenious methods. There is one that takes place on a bus in a third world country. The victim-to-be is holding their bag or backpack on their lap when the friendly stranger in the next seat suggests that the victim place the bag under the seat to be more comfortable. The stranger reassures the traveller by engaging them in a conversation. The victim feels at ease and finally decides to put their bag under the seat. Little do they know that the barefoot person in the seat behind has immediately begun to use their very dextrous toes to undo the clasps on the bag and is now removing some of the contents (clothing, shoes, passport and wallet etc). By the time the traveller gets off the bus, the bag is closed again and nothing is suspected. Then there is the lucky bracelet scenario. 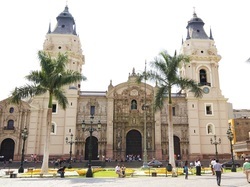 You are taking photos of the grand churches in an historic public square in South America (or temples in Asia) when a cheery looking child comes up to you and asks if you would like a good luck bracelet at no charge. The bracelet is really just a colourful piece of wool string. As there is no charge and you want bring back a story of a nice experience, you agree. The child says s/he will give you one around each wrist for double the luck, and gives you a pair of scissors to hold (so you don’t question why both of your wrists are being tied together). After the string is tied the child grabs the scissors—along with your wallet or camera—and runs off into the crowd. You are left standing there with both wrists tied together. And remember those comical scenes from the movies where the photographer keeps asking the subject to move back in order to fit into the camera frame and eventually the subject falls off a cliff or into a fountain? Well, this happens in real life, but the photographer is usually a scam artist. The typical scenario is that you are at a tourist attraction when someone asks you to take their photo. You agree. Then the stranger suggests that s/he reciprocate by taking your photo. A trust scenario has been developed because you have already held the stranger’s camera, so you agree. The stranger asks you to back up—sometimes in the direction of a low archway or doorway (where you will hit your head) or into the fountain, or down a small hill. As soon as you are off balance or hurt or a reasonable distance away, the stranger disappears with your nice digital camera (and sometimes enough information on your photos to visit your hotel room—or even have a friend visit you in your home town, and do more damage). The ‘trust’ scenario is also very effective in airports where people generally feel safe. A stranger asks you to watch their luggage while they run to the washroom. You agree. When the person returns, s/he offers to watch your bags if you would also like to visit the washroom. With the trust scenario in place, you agree. The second you walk away in one direction, your luggage does the same in the opposite direction. Taxi scams are high on the vigilance list. It could be a simple matter of rushing to the airport, giving the driver money for the fare, receiving your change in a wad of bills, all clumped together, and then when the taxi takes speeds away, you realize that s/he has shortchanged you. Another popular scam is the taxi meter that is pre-set from when the last passenger was in the taxi. You don’t notice this and all of a sudden the inexpensive ride to the hotel or restaurant is double what you expected. Or there is the phony night time charge scenario where the taxi, instead of taking you to the front door of the restaurant or hotel or resort, parks several meters away and then demands a special night time surcharge on the amount that the taxi meter is displaying. The aggressive driver may keep the doors locked and try to intimidate you into paying. (In this case, the best strategy is to insist that the driver pull up to the front door of the resort so you can check with the concierge about the night time charge. The driver will usually relent, say some nasty words, but accept the fare that is properly displayed on the meter). And there are hundreds of variations of these taxi scams. Credit card scams are probably the most popular as that little black strip on the back of the card can, with a proper card reader, reveal a great deal of personal information about you and can, in the least, involve the theft of your money, and in the most, can involve identify theft. And we have all been subject to internet and email scams, where someone has ‘found’ $20 million dollars and is willing to share it with YOU, if only you will provide them with your name, address, phone, and bank account number. I have a special folder called ‘scams’ where I direct these kind of emails—unopened, of course. As soon as you open an email attachment or even respond to the scammer, you have basically accomplished what they set out to do—which is to cast their net large (by sending out thousands of these emails) and then wait for a few responses. Even if you ask to be removed from future email transmissions, the scammers now know that your email is ‘live’ and they can sell it to their friends who will pester you and try various methods to extract your cash or personal information in the years ahead. Travel scams work because they are for the most part, simple scenarios that take advantage of your fears or your gullibility or your sense of good will. One of the more innocent scams I encountered was the powdered milk scam in Kathmandu where a young boy attaches himself to a tourist and provides information on the historic temples, for free. After a while, the tourist, enamoured with the knowledge and the personality of the boy, offers some money. The boy refuses and suggests that the tourist can buy a box of powdered milk for the boy’s family. In the spirit of being magnanimous and worldly, the tourist agrees and sometimes will even buy 2-3 boxes of the milk, which can sell for $8,00-$10.00 a box. With tears in his eyes, the boy thanks the tourist, who in turn has tears in HIS eyes. They depart. But as soon as the tourist is out of site, the boy returns the boxes to the store where he gets $2.00 per box commission. The storekeeper puts the boxes back on the shelf for a repeat performance in a few minutes. Everyone walks away feeling good. And the circle game continues. Being aware of travel scams and how they work is part of the preparation that any traveller should undergo before they set out to explore, whether it’s a package tour, a luxury cruise or independent travel. Always be vigilant, use hotel safes to store your valuables, take minimal cash with you when you are out and about and retain a healthy scepticism when meeting new people. There are just too many scenarios where a traveller who has known a friendly local for less than 5 minutes, decides to put their total trust in the person and the results are sometimes disastrous.